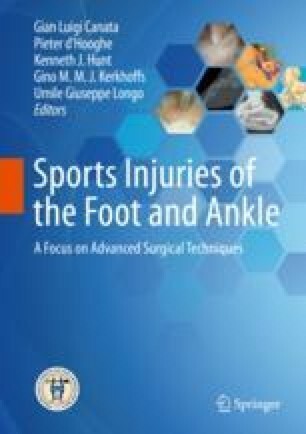 Hallux valgus is common in athletes; however, special care must be taken for decision-making concerning to treatment. Pathogenesis, diagnosis, conservative treatment, and surgical treatment are discussed in this article. Conservative treatments include shoe modification, stretching, therapeutic exercise, insoles, orthoses, and taping. Ultrasound-guided nerve block is effective for a patient with a pseudoneuroma of the digital nerve on the dorsal side of the first metatarsophalangeal joint. Excessive dorsiflexion of the first metatarsophalangeal joint is required particularly in dancers, and because hallux valgus surgery reduces the range of motion of the joint, in principle, conservative treatment should be selected. In cases of post-traumatic hallux valgus, surgery is performed to repair the medial collateral ligament. When we make osteotomies, Chevron or Mitchell osteotomies are recommended if pain is affecting competitiveness and deformity is mild or moderate. Because good range of motion is maintained, distal osteotomies alone for patients in their late teens will be good indication. For active dancers, neurotomy is sometimes considered because it does not diminish the range of motion of the first MTP joint. Curative surgery for severe cases in adult patients should only be recommended after they have retired from dancing.